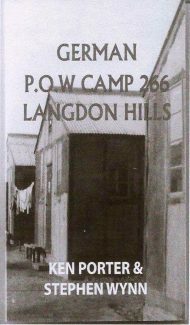 This book isn’t a story it’s an historical account of what life was like for the German POWs who spent time incarcerated in Camp 266 at Langdon Hills in Essex. The camp opened just before the end of the Second World War and saw the arrival of its first inhabitants in April 1945 before finally closing its doors in June 1948. The camp could hold up to 800 prisoners at a time and also had satellite camps at nearby places such as Tillingham and Purfleet. 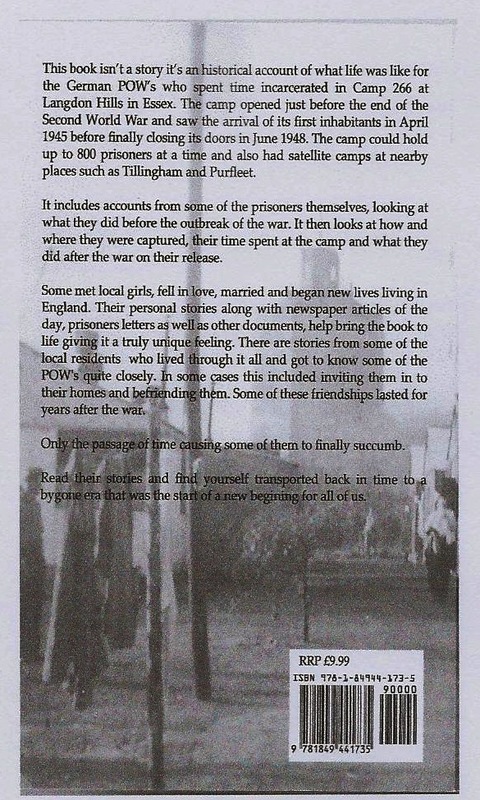 It includes accounts from some of the prisoners themselves, looking at what they did before the outbreak of the war. It then looks at how and where they were captured, their time spent at the camp and what they did after the war on their release. Some met local girls, fell in love, married and began new lives living in England. Their personal stories along with newspaper articles of the day, prisoners letters as well as other documents, help bring the book to life giving it a truly unique feeling. There are stories from some of the local residents who lived through it all and got to know some of the POWs quite closely. In some cases this included inviting them in to their homes and befriending them. Some of these friendships lasted for years after the war. Only the passage of time causing some of them to finally succumb. Read their stories and find yourself transported back in time to a bygone era that was the start of a new beginning for all of us. My family also became close friends with two German POW Hans and Walter who were based at the Langdon Hills POW camp. They were like family to my mother’s family who lived on Old Church Hill and over the years we stayed in touch. 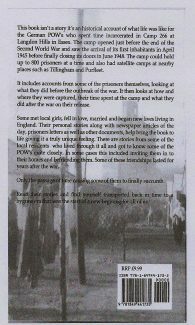 Does anyone know where I can find out more about the POW’s entry into the camp and how they ended up being there? My Grandfather William (Bill) Turner was, I was told, a warden at the Prisoner of War camp. Can’t verify this or add more to it but somebody may have some knowledge on this? Do records exist and are they available to the public? After my father read an article in the Laindon Recorder asking for local residents to invite German Prisoners of War into our homes at Christmastime, he went to the camp with my brother and brought back two prisoners – Heinz Kraft and Karl Marx. This was the first time we were allowed to bring the prisoners into our homes. These young men were very frequent visitors to our home (eventually almost like family) and brought some of their comrades to visit our neighbouring relatives. After they were repatriated, both Karl and Heinz had to go back into what was then Eastern Germany. Heinz and his family eventually escaped to West Berlin and their first holiday, in 1962, was to visit us in Laindon. They had to fly over Eastern Germany as they could have been arrested if the crossed into the East, but the close bond we had with Heinz made their efforts worthwhile. We kept in touch on a very regular basis. They paid for my mother to visit them in West Berlin and said she was their “Queen Mother” as she gave to them when times were particularly hard for us in Laindon too. We then went to Berlin when Heinz and Annemarie’s eldest son got married – he was my mother’s godson by proxy. More visits ensued. My eldest daughter took a schoolfriend and stayed with Heinz and Annemarie for about 3 weeks, which improved her German tremendously. Their eldest son came and visited us and Heinz and Annemarie paid us many more visits. My grandchildren said they were like extra grandparents. We still keep in touch with all their family and I have been to see them in Berlin many many times. My three (now adult) children and my grandchildren have also visited them – just like family. Heinz died a few years ago when he was about 85. He phoned me a few days before he died. He was the same build and had the same sense of humour as he had as a young man. I’m still in touch with his wife on a regular basis. The was a true friendship which was greatly respected by their friends and ours. I think I could write a book myself about the times we shared. The article raises the point that some local girls married the German POW and reminds me that one such girl whom I knew, Mary Thomas, was among these. By strange coincidence, Mary’s brother Charlie had been a prisoner of war in Germany.